Software conflicts that may lead to, one of your software unusable, which sometimes include your OS (Operating System). The other thing is a sudden power interruption that may cause hardware memory failure and software as well. Then, Computer virus infection that may affect vital computer system files, thus leaves your Operating System corrupted. The above examples are just a few of so many computer problems that a PC user may experience. Nonetheless, Restoring your Operating System can fix these issues with the rate of almost 90%. Personally, Restoring OS is one of my primary approach in fixing computers. It doesn’t affect your Files. It can remove the virus. Yes, Restoring your OS reverse your computer system to specific previous date, thus, remove newly installed malicious script or software. There are three (3) ways to restore Windows 7. Just follow the System Restore wizard instruction, a restart may necessary to completely restore your computer. You can opt to use the recommended restore point or choose different restore point. If you successfully restore Windows 7 you will be prompted, otherwise if you failed to restore Windows 7 you will also be advised. The second method of restoring Windows 7 is through Safemode. This is only advisable if you cannot Restore Windows 7 by using the first method above. There are instances that you cannot restore Windows 7 under normal circumstances, which sometimes due to virus infections. First turn on or restart your PC. While powering on your computer or after hearing a beep, continuously press F8 until you see the Advance Boot Options. If you fail to see the Advance Boot Options, instead you see a windows logo, restart your PC and try again. In the Advance Boot Options use your arrow key to select the Safe mode option and press Enter. Log in to your computer as Administrator, just choose “No” from the pop up window. Follow the wizard, select the best date that you remember your computer works fine and proceed to the next step accordingly, several restart may take place. You should see a message, that your computer is successfully restored or failed. The third method has almost the same procedure as method 2. However, it differs from selecting options at Advance Boot Options. Instead of Safe mode alone, choose Safe mode with Command Prompt. In the command prompt, type rstrui.exe, wait for a few seconds, Windows 7 restore will start automatically. As usual, follow the wizard until your PC restart itself for the Windows 7 restore completion. Upon finishing windows 7 restore, a pop up window may appear, informing you if the windows 7 restoration process is successful or a failure. No restore point has been created. 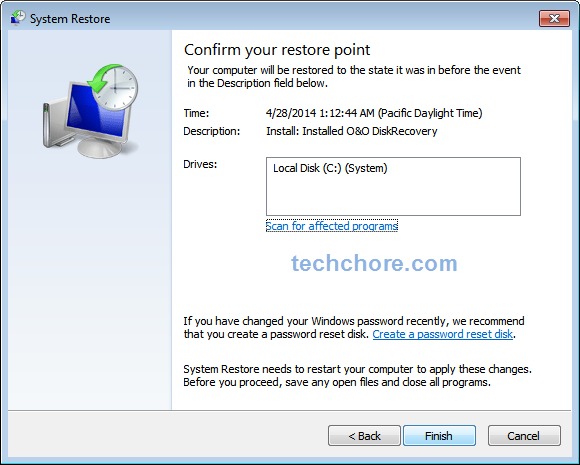 There were times that the Windows 7 automatic restore point creation may not work, that’s why it is better to manually create a restore point right after your OS (operating System) installation. Windows 7 System restore is corrupted. Yes, System Restore can also be corrupted because of various reasons. It can be a virus prevented it from running or a hardware problem. 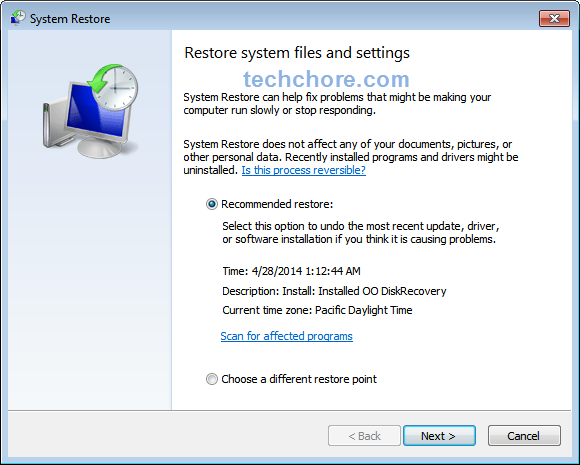 Windows 7 System Restore is one of our best option of recovering our computer from sudden failure. However, in some instances, it may not be an option. If the System Restore itself is the problem. The number one point above, manually creating a restore point from the very start, increase the possibility of making use System Restore in the future. On the other hand, if System Restore fails, System Backup recovery or Operating System re-installation and a possible hardware replacement may be needed. 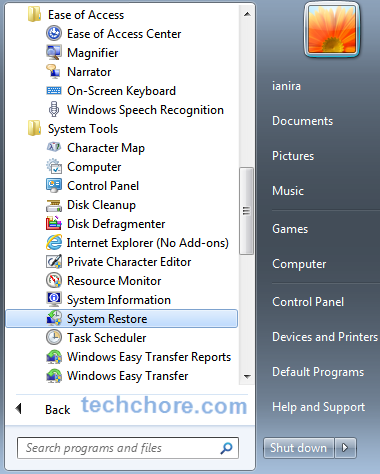 Do you have any idea of how to use system restore effectively? Speak your mind at the comment box below. Why Do We Need Safe Mode in Windows? OK! I have a PC, I had to use my Windows7 Ultimate CD for upgrading it. I used the upgrade for having big issues and it fixed the issue for a little while. Then the windows couldn’t restart so had to do the whole CD windows setup. The issue happened after the setup finished. It keeps restarting and ask me to do safe mode or safe mode with network or safe mode with command prompt or start normally. I picked each and every time it restart. In Windows set-up I deleted and format the partition. I did the setup at”it is a logical partition”. I tried to make the setup at System partition which didn’t work. I tried to delete the system partition to make it available but with no use. I have a 500 GB Hard Disk and it is like not in the use a lot for i use a Notebook mostly. All of this happened while attached the External Hard Disk into the PC. The external HD dead now and PC dead now as well. What I can do to fix the restart of the Windows OS, it can’t start the Windows. Thanks if get any reply and i have by the way 8GB Ram as well. Hello Mohammed, first of all thank you for asking that question here. With all the information that you’ve given, I am afraid that your hard drive is dead. When installing Windows, you are supposed to install it in system partition but you can’t which is not normal. There is something wrong with your hard drive. You can try this solution “How to repair bad hard drive?“. How to manage and configure Windows services? How to Change PLDT Fibr admin password and Why?